We may think that nostalgia is something only adults feel, looking back on their childhoods, but children feel nostalgic, too. The most powerful sense of it is created by looking into brightly lit windows at dusk and night. For young children, those windows can seem magical, offering glimpses into other worlds, other lives, all warmly lit, glowing with coziness. The American painter Edward Hopper made such scenes lonely and desolate (as in Nighthawks where a few people stave off their isolation in the yellow light of a diner), but they can be enchanting to a child, a beckoning to enter another world, an intimate peek into other lives. 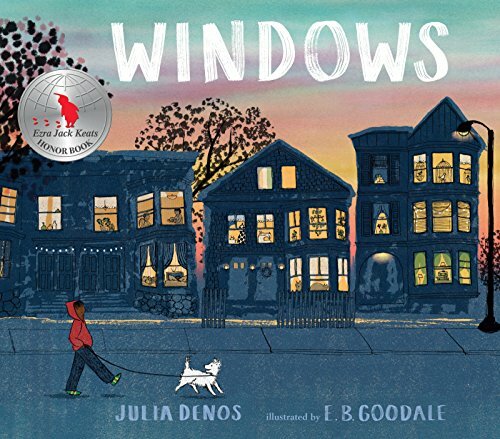 This sense of warm worlds is beautifully evoked in Windows, written by Julia Denos (author-illustrator of Swatch: The Girl Who Loved Color) and E. B. Goodale (in a debut picture book). The text is simple and inviting, with a perfect cadence for reading out loud, but it's the art that is the star of this book, vividly recreating that longing that windows inspire as they cast warm glows on the sidewalk outside. Of course, the most welcoming window of all is the one at our own home, and the book ends as the nameless boy comes back to his own house, his own cozy windows, and the mother inside who waits for him. We can smell the dinner simmering in the kitchen, feel the warmth after the chill outside. This picture book is its own kind of window, the turning of its pages its own kind of stroll through the evening. And back again, to where we belong, to home.